People huddled around a blocked-off street in front of a stage Downtown, clapping for a partially obscured performance. 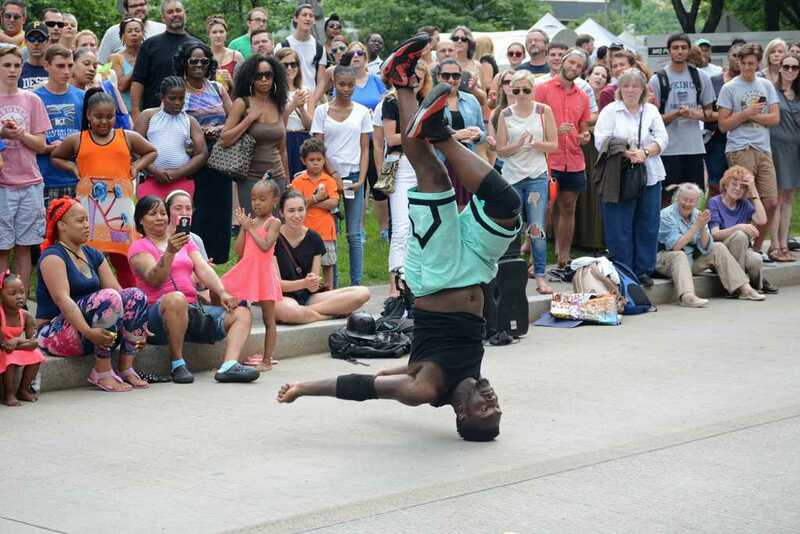 A show like this is no surprise at the annual Three Rivers Arts Festival, a 10-day event of free music, art and dozens upon dozens of local and regional vendors. Sponsored by the Pittsburgh Cultural Trust and Dollar Bank, the festival, currently in its 57th year, runs June 3 through 12. Between flips and tricks, The Famtrons weren’t shy to remind people that they were there — in part — for the money. “Remember — Obama wants change, we want fifties,” Midnight said, punctuating his not-so-subtle hint with a huge grin. The Famtrons ended their show by picking out four members of the crowd and lining them up to touch their toes. “I need to let you know — don’t move. There’s going to be a black guy, moving very fast, with no police behind him,” Midnight explained. Then one troupe member took a long running start and flipped over all four grown men. When their show finally came to a close, The Famtrons held hands with their volunteers and engaged in a call-and-response send-off. “There’s only one race in this world today,” Midnight began. The Famtrons’ show runs several times a day, but it’s not the only sight worth seeing at this year’s festival. White booths replace the bottoms of Downtown skyscrapers. Faint music echoes down the streets originating from any of the three stages, be it the Acoustic Stage, Gateway Clipper Stage in Gateway Center or the Dollar Bank Main Stage in Point State Park. Caricature artists and street musicians with upside-down hats at their feet dot the sidewalks. At the fountain just off Penn Avenue, children push model sailboats with long bamboo poles. The fountain is decorated to match the port theme with colorful, non-descript flags crisscrossing over the water. As people meander between tents, there’s always something trying to catch wandering eyes. A canvas that reads “Sock Monkeys Have Issues” in all caps, a grotesquely mystifying depiction of Alice in Wonderland, professional nature photography, bright, punchy blown glass and decorative bowls made out of ancient-looking wood all vie for passing attention. One of the festival’s Emerging Artists is Nathan Doverspike, a recent graduate of the Pittsburgh Art Institute. Doverspike says he draws from an eclectic pool of influences to create his distinct work. Doverspike says his biggest seller is his Pittsburgh Island print, which is an urban collage stuffed with many iconic Pittsburgh images, such as the Cathedral of Learning, an Andy Warhol Campbell’s Soup can and even the brief but memorable giant rubber duck that was docked just off the Point in 2013. Doverspike used one of his works as an example, gesturing to a print of a grey-ish purple rock-snake monster. Upon closer inspection, it reveals itself to be a reimagining of the Pokémon Onix. From futuristic, gear-like jewelry and elaborate, rustic wind chimes to a cupcake made entirely of origami and hand drawings of recently-deceased celebrities, the festival’s options are as numerous as they are authentic. Funyak also related the festival’s purpose to her own post-college plans. “As someone who aspires to work in a museum or arts non-profit organization after graduation, seeing free and accessible artwork for the public at the festival was super rewarding,” Funyak said. Ultimately, though, the festival’s easy-going approach to summer fun is its true selling point.